Peak's Shade Tower is a long-ruined Nordic tower that has been reclaimed by nature. It is inhabited by a leveled spriggan. Following the main road east out of Falkreath towards Helgen, the path leading up to the tower is marked by a cairn on the right-hand side of the road. There is a purple and three red mountain flowers and a mora tapinella fungus growing from a large tree stump just outside the entrance. The tower has long eroded and the only inhabitant now is a spriggan. Inside is overgrown with vegetation, including a purple and three blue mountain flowers and two thistles. It is also a good place to find monarch butterflies and blue butterflies during the day, but only a few torchbugs or luna moths at night. 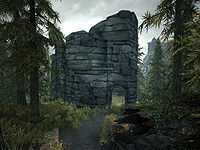 Along the west wall of the tower, hidden by the vegetation filling the tower is an unlocked chest containing random loot. If you have Dawnguard installed the spriggan may be an Earth Mother and you may also encounter some vampires. This page was last modified on 18 January 2015, at 17:44.